Update May 21: Added a few DNFs after updated data was available in the Athlete Tracker. 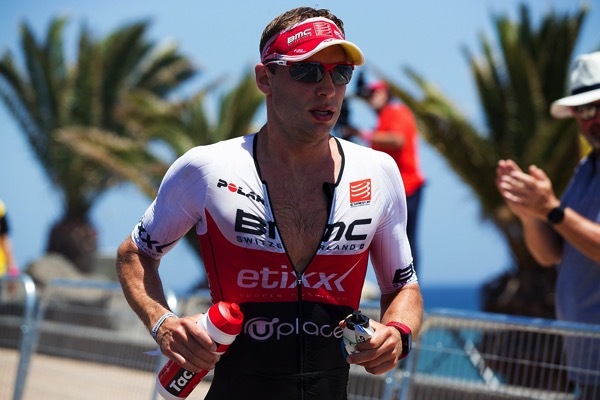 The conditions for this year’s race were typical for IM Lanzarote: Nothing special for the swim and run (almost no adjustments) but a very slow bike (adjustment of -19:11) and a slow race overall (adjustment of -23:51), even for the “slow standard” of Lanzarote. Still, there were two new course records: Lucy Charles posted new swim and bike course records. She improved her own swim course record from last year by five seconds, and also Tara Norton’s bike course record (5:26:23 from 2010) to 5:23:29. Romain Guillaume quickly took the lead after the swim, after 90k he was joined by his BMC Etixx teammate Bart Aernouts. Bart stepped up his bike performance and posted the best split. When his teammate struggled on the run, he took control of the race and won by nine minutes. Second place went to Alessandro Degasperi who lost some time on the bike but then posted the fastest run split. Defending champion Jesse Thomas couldn’t make up any time to the leader on the run, but a solid overall race saw him finish in third. Fourth place went to the relatively unknown Peru Alfaro who had taken a two and a half year break from Ironman racing, Romain Guillaume struggled on the run but held on to fifth place. The female race was dominated by super swimmer Lucy Charles. It wasn’t a surprise she was leading after the swim (posting a new swim course record), but then she continued to extend her lead on the bike – also posting a new bike course record. Her lead in T2 was close to 20 minutes, leaving just a little bit of hope for the chasers. However, she was able to have a solid run as well and won the race with a comfortable margin of nine minutes. The only athlete able to take a serious chunk out of Lucy’s lead was Corinne Abraham who posted the fastest marathon to finish second. In T2 Lucy Gossage seemed to be in the best position to challenge Lucy for the win, but she had indicated before the race she hadn’t done her usual training and it showed a bit with a 3:13 run, she was still able to finish third – giving Great Britain a podium sweep. Solid bike rides allowed Jeanne Collonge to finish in fourth place and Saleta Castro in fifth. Lucy Charles (2.115) and Corinne Abraham (2.675) haven’t scored many points before, they still need a lot of points to be able to qualify.